What are the "Band Member Pages"? Why does my Public Calendar page show only "This service is currently disabled"? Why does my Client Booking page or Agent Services page show only "This service is currently disabled"? Why does my Public Song List page show only "This service is currently disabled"? What is a Template, and why should I make/use them? What is a Black Out status, and why should I use it? What is the Duration value, and why should I use it? How can I add all the month's gigs in just a few seconds? How are band rehearsals handled differently from other gig types? I hear you can use WheresTheGig as a way to totally organize your rehearsals. How do I do it? I sometimes need to include documents with gig-related information, perhaps a PDF with parking passes, or maybe I have a folder containing multiple files. How can I include those with the gig information? How do I change my (or another user's) password? How do I grant site access to a user? How do I remove site access from a user? How do I grant administrative access to an existing user? How do I remove administrative access from a user? Our band has started wearing pink boas and spangled G-strings. How do I add this to the "outfit list"? Our band has stopped wearing pink boas and spangled G-strings. How do I remove this from the "outfit list"? Our band has started playing a lot of Elbonian Fertility Celebration parties. How do I add this to the "gig-type list"? I don't think our band will be playing any more Elbonian Fertility Celebration parties. How do I remove this from the "gig-type list"? My band's website has a tasteful chartreuse background color with a magenta foreground. How can I make the WheresTheGig public calendar and booking services pages match our website colors? I want to really, really customize all aspects of my public pages. In fact, it would be really convenient if I could use my website's external stylesheet definitions define my WheresTheGig public pages. Can I do this? I like the WheresTheGig public calendar, but I'd rather have the gigs displayed in a simple list format. How do I do this? I'm concerned that my country's government will get us into a war with Elbonia and draft my band, so I'm moving us all to Sweden. How do I change the default country for our gigs? We got a new guitar player. What's the easiest way to add new personnel? Now that we have a new band member do I have to tediously edit each gig to add him in or is there a better way? The guitar player finally got email. How do I update her information? We have 34 members of our jazz big band / orchestra / choir / etc. and it's very tedious to enter one at a time each member's information. Is there a better way? I don't want to give access to some musicians who only occasionally play with the band. How should I configure my site for this? How do I make it so band members see ONLY the gigs they're playing on instead of all the gigs on the band's schedule? How can my band notify me about Personnel Black Out Days? How can I set Personnel Black Out Days for other band members? Sometimes a band member might have a Personnel Black Out Day and wants to let me know, but the 'Busy' / 'Not Busy' choices are not sufficient. Is there a way for my band members to let me know they might be busy on a particular day? Can I export all my band's Personnel Black Out Days to my personal calendar, like my iPhone or Outlook or Google Calendar? It would be great if every time I update our schedule--add, update, or remove gigs--the band members would be informed about the updates. That way I wouldn't have to call or email everyone to let the know that there have been updates. How do I do this? I use different players for my gigs. 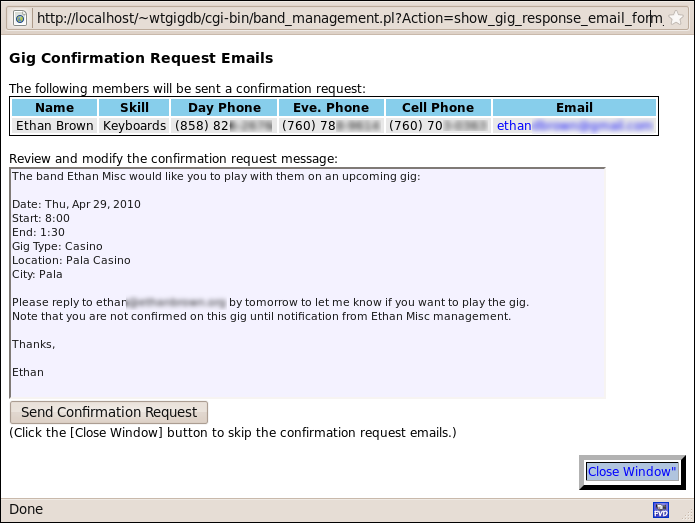 I understand that WheresTheGig will automatically send a confirmation request email to these players so I'll know if they'll play the gig. How do I do this? I've send a confirmation request email to a band member, but (the gig changed / they lost the email / etc) and I want to resend the confirmation request email for this gig. How can I do this? We have about 200 songs in our set list. Is there an easy way to import our whole list into WheresTheGig instead of adding the songs one-by-one? The easy import only imports the song name. I also want to import other song information like the song key, song duration, etc. Can I do this too? What is some of the special stuff that goes on during a song list import? How do I integrate setlists into the gig information? The stage-format setlists show only the song name. How do I make it also show the song key and other information? We have a couple of excellent sets, but we often use slightly modified versions of them. Is there a quick way to duplicate a set so we can do the slight adjustment, instead of creating the new set from scratch? How do I make WheresTheGig compute the total set time duration automatically? I want to make a nicely organized songlist for my website. How can I export my song list information to Excel, OpenOffice, or other programs? Can I archive some of my setlists so they don't always show up on my list of sets? I have a bunch of sets that I rarely use (like Christmas song sets) and they clutter up my list of sets. It would sure be convenient to be able to be able to show charts or lyrics on my tablet when I'm on a gig. How can I display detailed song information? I have some songs on my song list that I'd rather not have show up on the public song list page I use for my website. How can I keep songs from showing up on my public list? Can I use my venues from another account so I don't have to type in all that information again? I use AOL and when I try to access the site, my browser tries to download the file "band_registration.pl" or some other file that ends in ".pl". What's going on here?!?! How do I publish my public gigs to my Twitter feed? How do I publish my public gigs to my Facebook events? Can I automatically display my band's schedule on MySpace? Can I export my schedule to sites like Sonicbids and ReverbNation? There is a regional entertainment website that lists band schedules. How can I share my public gig information with this or other web applications, or with programs without going the trouble of decoding the calendar HTML? What is the RSS entry on the top menu bar for? Why is an RSS feed so cool to have? Can I export my gig information to my Outlook, Evolution, PDA, or Cellphone calendar? Help! My calendar and/or personnel blackout exports are showing up at the wrong time! Can I synchronize my gig information to my Google Calendar? Can my fans import our public gigs directly into their personal calandars? I love WheresTheGig and want to put a banner on my page! Ya got one? How do I have WheresTheGig compute gig mileages for taxes and other business purposes? I use multiple WheresTheGig accounts. Is there an easy way to show all account gigs on my calendar, and to switch accounts without having to log out and log back in? Use this button to update information about a particular gig. For example, if the gig location was unknown when the gig first came in but is now available, you can include the new information through the Edit Gig button. This button displays all available information about the selected gig, including gig location map and participating personnel contact information. Gig information comes in close to the gig and you think members may not check the website. Some musicians on the gig don't have access to your site for one reason or another, but do have email. This is the site that your non-administrative band members see when they log on to your Where's The Gig site. It basically shows them the gig list, gig calendar, and gig details. However, the don't have the ability to modify the gig information or site configuration. Click on the Public Pages tab. Click the Provide a public gig calendar checkbox. Click the [Set Public Pages] button. Instructions for providing a link to the calendar page are provided in the section above the checkbox on the Site Configuration page. Click the Provide client booking page and booking-agent services page checkbox. Instructions for providing a link to the Booking Services pages are provided in the section next to the checkbox. Click the Provide a public gig calendar checkbox if it is not checked (the p ublic calendar must be enabled to provide the public song list). Click the Enable a public songlist checkbox. Instructions for providing a link to the public song list page are provided in the section above the checkbox on the Site Configuration page. Templates are useful when you often perform at the same location. A template contains most of the information that goes into the gig form, except for the gig date and status. So, for example, if your band tends to rotate through four or five clubs, creating a template for each club makes it really easy to add your gigs. Instead of typing in the sound check, gig times, dress, etc. you just select the template and all of the information is filled in for you. Go to the gig you want to use by using the gig list on the page. When the gig information is displayed, Press the [New Template] button. The information from the [Edit Gig] form will now fill in the template entries. Click the [Add Template] button at the form bottom. A Black Out date is useful if you want to flag a date when your band can't do a gig. This can happen if a key band member will be out of town or otherwise unavailable, or if the band will be on travel to an out-of-town gig. If you try and add a gig on a blacked out date you will receive an error message. Likewise, if you try to black out a date that has a gig on it you will also receive an error message. Band members can let you know about any unavailable dates by using the Set My Blackouts page (available both on the administration and band members' pages). If you book a gig with an unavailable band member a warning will be displayed so you'll know to either not book the gig (yeah, right) or get a replacement player (more likely), or just do the gig without them and make more money per player (most likely). Check availablility right on your gig form: Set the gig date and then click the personnel icon ( ) to get a list of any conflicts. Easy calendar-based checkboxes for rapid date entry. Members can add comments to let you know when during the day they are not available. Blackout comments are added on the "List All My Blackout Days" page on the "Set My Blackouts" tab. Warnings displayed if a blackout date coincides with a booking. Convenient listing of all members' unavailable dates on the Administration site. You (or the person with the administration email account) will be notified by email when a band member modifies their blackout dates. Easy part: Associate personnel with their login name. Go to the Review/Edit Personnel page. Select a band member from the list. Click the [Edit] button on the page bottom. Select their associated Login Name on the form. Click the [Save] button on the page bottom. Hard part: Make your band members keep their schedule up-to-date. Click the Set My Blackouts tab to display the user blackouts page. If you are an administrator, you will see a box with a pair of radio buttons labeled "Me" and "Another Member". Click the "Another Member" option. A popup menu will appear with the names of all of your members. Select the member for which you wish to set the blackout dates. Click the [Set Member] button next to the popup menu. You may now set the blackout dates for the selected member. Blackout dates will be set for this band member until you either select a different member and click the [Set Member] button, or click the "Me" radio button option. Click on the "Site Customization" tab. Click the [Set Options] button. Click the Set My Blackouts tab. 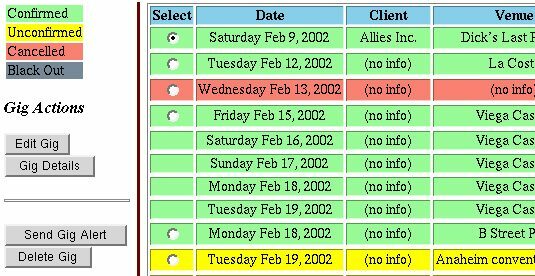 Click the List All Personnel Blackout Days link below the navigation tabs. Click the link: "Export blackout list to your personal calendar (ICal format)"
For Google Calendar, the Google Calendar export page provides a checkbox to export member blackouts along with gigs. Note: Be sure that your default time zone is set correctly, otherwise the ICal entries may be offset in time. How to set your default time zone. WheresTheGig will automatically, once a day, send out an email with a list of all modified gigs. The list of gigs is sent to any band members that are assigned to the gig, and band members are sent a list of only the gigs they are assigned to. Needless to say (but I'll say anyway), the emails will only be sent to band members that have email addresses included in their personnel information. Click on the "Account Options" tab. In the "Email Schedule Updates" section check the checkbox labeled "Email schedule updates to band members". This is a nice feature, as it keeps band members up-to-date even if they don't have user access to your WheresTheGig account (fill-in musicians, for example). Note: Some ISPs, notably AOL, will "blackhole" mail from WheresTheGig. That is, the mail won't go into any user's folder and also won't get bounced back to WheresTheGig. I suggest you verify that your members are receiving the update emails. If they are having problems you can have them try adding the server "wtg.com" to their email whitelist. Email will be sent only to players that you specify as described below, so it won't be sent to any of your band members that play most of you gigs (since that would be pointless). In the "Enable Member Gig Confirmation Emails" section check the checkbox labeled "Enable send confirmation requests to specified members". Click on the "Review/Edit Personnel" tab. Select a player that you want to receive the confirmation request email. Click the [Edit Selected Personnel] button. At the top of the form, check the checkbox labeled "Send email to member requesting gig assignment confirmation"
Click the [Save Personnel Edits] button at the form bottom. The confirmation request email form will now be displayed if any of the selected players for your gig are flagged to receive this mail. Be sure that any players flagged to receive the mail have an email address specified in their personnel information. Only one confirmation is sent to a player per gig, so even if you update a gig a player will not receive a second email about the same gig. But if you add another player during your update, they will receive the confirmation request email (if they are flagged to, as above). The easy way where the member can respond to either the first request or your resent request. The more complicated way where the member can respond ONLY to your resent request. If the member has not yet responded to your request, the "Resend Request" will be available in the "Reset Response" menu. A dialog will appear that will allow you to modify the message before you send it. 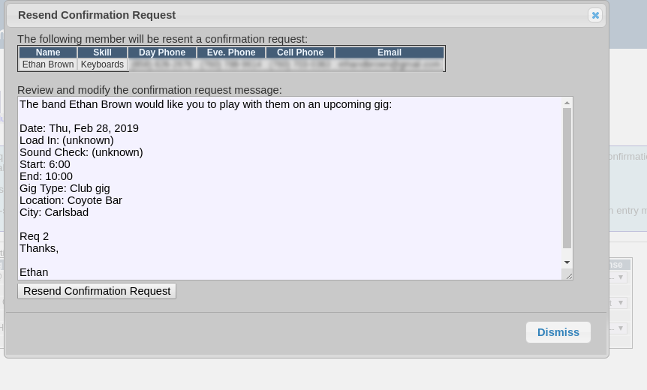 You can re-submit a confirmation request email to a band member by purging the current confirmation response record for this gig / band member, and then creating a new request. You probably only want to use this method if you don't want the member to be able to respond to your initial request, only to the resent request. Click on the "Display Gigs" tab. Click on the "Review Confirmation Requests" link on the submenu bar below the tabs. In the status table, find the row for the gig and band member for the confirmation request that has been sent previously. If no such row exists, be sure that the instructions above have been followed. From the "Reset Response" menu on that row, select the Purge Record option. Select the gig you want to re-submit to the band member. Select the "Edit" icon above the gig table. Click the [Save Gig Edits] button at the page bottom (you don't have to make any actual updates to the gig, unless you want to). The band member should now appear in the member table on the Confirmation Response page. Click the [Send Confirmation Request] button. The band member will receive a new confirmation request email. If you want to, you can make a note in the confirmation request text region so the member knows this is a re-submission. Note: Since the original confirmation response record was purged, the band member will be shown an error if they attempt to respond to the original confirmation request email. The Duration value selection is just to the right of the gig date selection. This is useful if you do multi-night gigs. You just enter the gig once and set the duration, and then the gig shows up on all of the consecutive dates. For example, if you have a 5-nighter from Tuesday through Saturday, just add the gig on the Tuesday and set the duration to 5. This makes it really easy to enter multi-night club gigs, especially if you're using templates. There is only one selection box for a multi-day gig. That is, none of the subsequent days on a multi-day gig have a selection option. The multi-day gig only counts as one gig in the gig count at the page top. The entire gig duration will show up if any portion of the gig duration is in the time interval shown. An additional Through column will show up on the gig detail of a multi-day gig. Click on the New Gig tab. Click Add Gigs By Month on the sub-menu (right below the tabs). Follow the instructions on that page. They're really easy. They show up on gig lists in a special font. Confirmed rehearsals show up with a special color on the band calendars. Rehearsals have a special Gig Details page format. Rehearsals never show up on the public calendar. Rehearsals never show up on an booking service inquiry. If you already set your own rehearsal gigtype, I suggest you remove it from your gigtype list. Select "Rehearsal" as the gig type. Create a "venue" for your rehearsal location(s), and select the appropriate "venue" for your rehearsal. If you include the address in the venue information then the rehearsal details page will create a map to the rehearsal location. Including the phone and email address for the rehearsal location will also cause these to be printed on the rehearsal details page. Set the rehearsal start and end times as the gig start and end times. Use the "Additional Gig Information" textfield to provide the rehearsal agenda. Select the list of band members from the "Gig Personnel:" list to indicate who needs to be at the rehearsal. Create a set named "Rehearsal". Each rehearsal, assign the rehearsal songs to this set. To provide mp3s, charts, and lyrics, fill in the relevant song attributes for the rehearsal songs. Enable setlists in the gig information (click here for more information on this). Select the "Rehearsal" set from the set selections on the gig entry form. To greatly speed up the process of adding a rehearsal to your schedule, create a rehearsal template. The gig form includes a field in the Additional Gig Information section labeled External Resource URL. You can provide any valid URL to reference a document on a file sharing systems like DropBox.com, Google Drive, and many others. When you provide a URL in this field it will show up as a clickable link on the gig details page and the gig alerts. Your band members can then easily click the link and obtain the file or access the shared folder. Yes. WheresTheGig can export your gig information to any "iCalendar" compliant calendar application (such as those listed above). Create an ICalendar feed for your local calendar (Preferred Method). What does an exported gig look like on your local calendar? The event description will list much of the gig information (load in, sound check, food, sound lights, etc). Many calendar applications bring up the description by double-clicking the summary, or through a selection on the Right-Click menu. 800 pm 1100pm Huh? What? About 9 Whenever Huh? What? You get the idea. If WheresTheGig can't figure out the gig time, it just displays it as an "All Day" event. Click on the Export To Calendar link at the top of the page. Click on the [Show ICal Feed URL] button to provide a feed for your gig information. Click on the [Show Member Blackout ICal Feed URL] button to provide a feed for your band members' blackout dates. Copy the URL and paste it into your calendars network calendar configuration field. NOTE: If you export your band member blackout days, be aware that if a member blackout is removed from WheresTheGig it may NOT be automatically removed from your local calendar. You may need to clear your local calendar manually before re-exporting. Click on the [Update Active Gigs (CSV)] button. Save the calendar export file to disk. Sort by "Subject" by clicking on the heading labeled "Subject". Select all of the previously imported events (click on the first one and shift-click on the last). Select [File]->[Import and Export] from the Outlook menu bar. Select Import from another program or file from the action list. Select the file you just downloaded from WheresTheGig with the file chooser. You've already removed all of the gigs from your Outlook calendar, you can ignore the "Do Not Duplicate Items" choice. Select Calendar. The gigs will now be imported into Outlook. Click on the graphic at the top of the page. Click on the [Update Active Gigs (Ical)] button to update gig info, or on the [Remove Deleted Gigs] to remove inactive gigs from your calendar. Save the calendar export file to disk . Run Evolution, show the Calendar view. Select [File]->[Import] from the Evolution menu bar. Select Import a single file in the Import Wizard. Select the downloaded file using the [Browse] button. Leave "File type:" selection on "Automatic", click [Forward]. The destination folder "Calendar" should be highlighted. Click [OK]. Follow the instructions for Importing Into Outlook. If your device is capable of syncing directly to outlook, the gig data will be installed during the sync process. Some devices (such as cellphones) sync to outlook through their desktop client program. Follow the instructions for your particular device. Note that the calendar synchronization only goes from WheresTheGig to your computer. Any changes you make on your local calendar are not transmitted back to WheresTheGig. Help! My calendar and/or personnel exports are showing up at the wrong time! Click the Site Customization tab. Click the Account Options subtab. Set the default timezone at the bottom of the form. Click the Review/Edit Venues tab. Select the venue from the venue list. Check the venue timezone on the venue information form. Create a new calendar in your Google Calendar set. Google Calendar allows you to create separate calendars for separate event types (e.g. family, work, gigs, etc). You must create a specific, separate calendar for each WheresTheGig account you want to synchronize. This is important! WheresTheGig will assume that any events in this Google calendar pertain to your WheresTheGig account giglist. They will be cleared out and replaced with the current state of your WheresTheGig giglist. Click on the "Export To Calendar" link at the top of your WheresTheGig account page. The first time you access the Google Calendar export you will be directed to Google to grant permission for WheresTheGig to update your calendar. The first time you do an export you will select the destination Google subcalendar from your calendar list. Replace YOUR_ACCOUNT with your WheresTheGig account name. Go to the Changing A Password section. Click the [Change Password] button. How do I grant site access to someone? Go to the Adding Users section. If you want this user to have administrative access (the ability to add gigs, delete users, etc.) click the Grant this user administrative access checkbox. Click the [Add User] button. How do I remove site access from someone? Go to the Deleting Users, Adding Administrative Access: section. Select the user to remove from the Delete General Access To: list. Click the [Delete User] button. Select the new administrative user in the Grant Administrative Access To: list. Click the [Add Admin User] button. Select the user to remove from the Delete Administrative Access To: list. Click the [Delete Admin User] button. Note that this user will still have general access. Enter the new outfit in the first available text field. Click the [Set Outfits] button. Clear the text field containing the outfit to be removed. Go to the Gig Types section. Enter the new gigtype in the first available text field. Click the [Set Gigs] button. Clear the text field containing the gig-type to be removed. Click the Public Page Styling tab. Set the style attributes in the forms provided in that section. Click the [Set Style Attributes] button. Yes you can. If you wish to customize your public pages to a greater extent than the pre-defined customizations described here you can use an external style sheet. Your style sheet's URL is set in the same place as the other customization settings (described here). Note that if you use an external style sheet, its values will supersede the customizations set in the general customization fields described here. It may help you to examine the default style definitions at the top of the public calendar by viewing the HTML source of the page. You may need to set the <TD> background and foreground to the same values as <BODY> if you want the calendar and page backgrounds and foregrounds to match. In the "Public Gig Calendar/Songlist Page" section, select the As a listing choice. Select the Account Options tab. Click the [New Personnel] button. If this member is going to do most of your band's gigs, click the checkbox at the form top. That way they'll be selected by default for gigs. Fill in the member's information. Click the [Submit Personnel] button. Scroll down to the Add User form. Give them a username and password. If you wish them to have administrative privileges click the Admin Access checkbox. Click the [Gig Assignment] button. Select the gigs you want to assign the new member to. Click the [Set Gig Assignment] button at the page bottom. Select the member to update. Click the [Edit Selected Personnel] button at the page bottom. Click the [Save Personnel Edits] button at the page bottom. Yes. You can upload an Excel spreadsheet with your personnel information and create both the band member entry and account login. When the Personnel Information page is shown, click on the Import Personnel Data link on the submenu bar below the navigation tabs. Download the sample spreadsheet file provided on the page. Copy your personnel information into the file. Where's The Gig can send them email about your scheule through the Automatic Schedule Update Notify feature, and with Gig Alerts. Do not add access for this member, that is, don't give them a username and password. Add them to the Personnel roster either during the account setup process or through the page. Be sure to include their email address so they can receive Gig Alerts and automated schedule update notifications. When a gig is added or modified, email will be sent to any personnel on the gig, whether or not they have Where's The Gig access, when you have Automatic Schedule Update Notification enabled. If you want to send your notifications manually, use the Gig Alert feature. Click here for more information on Gig Alerts. Be sure to assign members correctly on the gig entry/edit page. Associate the band member with their login name. See here for instructions. Account users that are not associated with a band member will see all gigs. Click on the Account Options tab. In the "Restrict Member Schedules" section, click the Band members see ONLY their gigs checkbox. Click the [Import Songlist] link on the lower navagation bar. Enter your song filename into the upload field and click the [Import Songlist] button. In this example, the duration of Muskrat Love and the key of What's New, Pussycat? are not known, so it's left blank. Once your file is ready, go to the page. If a song is already in your WheresTheGig list it will be updated with new information from the uploaded file. Notes Things to remember, like patch numbers, "breaks in the second chorus", etc. Duplicate songs are removed from the import list. If you have identical song names in your import list, only one will be added. If, for example, you perform Satisfaction by The Rolling Stones, and also the version by Britny Spears, only one version (the last in your list) will be added. Songs that are already in your songlist on WheresTheGig will be removed from the import list. This is so if you import your songfile twice by accident you won't have to go through the tedium of deleting the 200 duplicated songs. And you also won't be asking me to do it. Note: you can add duplicate song names using the regular WheresTheGig [Add Song] function. During an advanced import, any Genres in the import file that are not already defined on your WheresTheGig account will automatically be included in your Genre list. By integrating setlists into your gig information, the sets to be performed at a particular gig will show up on the Gig Details page. Band members can then view the sets in two ways: (1) Set "song information" view provides links to the song mp3, lyrics sheet, and chart. (2) Set "stage" view provides a stage-ready set list with a large font, ready to be printed and taken to the gig. Click the [Set List Options] link on the lower navagation bar. Click the checkbox labeled Enable Set List Assignment On Gig Form. Your sets will now be displayed for selection on your Add Gig and Edit Gig forms. Select or de-select the attributes as appropriate to your needs. Select the set you want to copy. Click the [Clone Set] button to the left of the sets list. The clone will appear in the sets list. Select the clone in the set list. Click the [Edit Set] button to make your adjustments. WheresTheGig will display the total time duration of the set on the normal and stage view of the set list only if all of the songs in the set have duration values. This makes sense if you think about it. The easiest thing to do is to enable your public song list. See the [Site Configuration] page, "Fan Services" for instructions. Go to the Song/Setlist Management page. Click Song List on the submenu. Click the [Export Songlist As CSV] link. Save the file to disk, or open it with the program of your choice. Yes! Archived sets are still in your account but are not displayed by default on your setlist page. To archive setlists, select the Archive checkboxes in the setlist table and click the [Archive Selected] button. To show all of your set lists, click the [Show Archived Lists] button. You can de-archive a list by de-selecting the Archive checkboxes and clicking the [Archive Selected] button. You can add detailed performance notes such as plain text charts, lyrics, lighting cues, etc. and have them displayed on your mobile device during your performance. Go to your song list page ("Song/Setlist Management") and click on the "Song List" link below the tab bar. Click the [Create /Edit song Details] button. Add your notes in the text area. Click the [Set Song Detail] or [Show Song Detail] buttons. On your mobile setlist (or songlist), click the song to display your notes. You may adjust the text size by clicking the "-" or "+" buttons. You may edit the song notes on the mobile version by clicking the "Songs" link at the top of main page, selecting the song, and clicking the [Edit] button when the song notes page is displayed. The Genre attributes include a setting for public or nonpublic. Any song assigned to a Genre that has been set to nonpublic will not show up on your public song list. If you have administrative access to another WheresTheGig account, you can copy the venues from that account into your new account. This is an especially nice feature if you manage more than one band and book many of your bands into the same venues. Click on the Review/Edit Venues tab. Click the Import Venues From Other Account link on the navigation tabs submenu. Don't worry about duplicate entries. The venue import won't import a venue with the same name as an existing venue in your current list. A few WheresTheGig users that access the site through AOL have reported that the AOL browser attempts to "save to disk" rather than displaying a page. They also report that using Internet Explorer (or another regular browser [I personally recommend Mozilla]) loads the page correctly. I can only guess (since I don't use AOL) that this problem is a result of the AOL browser using the file extension (.pl) to identify the file type, instead of the "Content-Type" header value which provides the MIME type of the incoming file. This is pretty broken behavior (on the part of AOL). In short, just use a regular browser if the AOL one is giving you grief. Probably. Click on the Export To Calendar link at the top of the page and see if the site is one of the export options. Note! WheresTheGig will use the gig time and venue address from the information you entered into your site. If you didn't include the venue information it will show up as blank on the exported CSV file. You'll likely have to fill these values in by hand to have Sonicbids or ReverbNation accept your file. But if you provide all this information in WheresTheGig you won't have to do the extra work. WheresTheGig will automatic publish your public gigs to your Twitter feed. You can also send a gig tweet manually. Go to the Calendar Export page by clicking the link at the very top of the page. The Twitter export page will be shown. On your first visit you'll be directed to Twitter to provide permission for WheresTheGig to post tweets for you. Follow the simple instructions on the Twitter export page. WheresTheGig used to interact very nicely with the Facebook Events system, but unfortunately Facebook disabled this feature so now information must be posted to your timeline. A really simple way to do this is to copy and paste your public calendar link to your timeline. Alternatively you can post an image of your upcoming gigs to your timeline. The Facebook export page will be shown. You will need to be logged in to facebook. If you're not, click the [Login] button on the Facebook export page. The Facebook export is a "Facebook App", so you will need to grant it permission to create Facebook events in your account. Do this by clicking the [Login] button on the Facebook export page. Follow the simple instructions on the Facebook export page. Note: You can customize the image colors as described below in the MySpace section. The answer is "Yes". Here's how it works: WheresTheGig will create a graphic image that looks like a list of your upcoming gigs. You wrap the image in a link so that when people click on the image, it brings them to your public calendar, and they can see all of your gig details. The image is synchronized to your schedule every few minutes and so reflects your current public schedule. Note that this has *no* affect on your band's event schedule that is stored within the MySpace system itself. Go to the Site Customization page. Click the MySpace Schedule Colors tab. Check the checkbox to enable your image calendar. You can also customize the image colors to match your MySpace page. Click the [Set Image Colors] button. Copy the HTML in the MySpace section of the Calendar Export page. Go to your MySpace account, edit your profile, and paste the HTML you just copied into your MySpace profile content. The image with your schedule will now show up in your profile. The process that updates your image schedule runs periodically, so it may take a few minutes before your image is created and available. Where's The Gig provides XML and JSON exporting functions so that other websites or programs can easily access your public information. The information that is exported is similar to the information listed on your public calendar, no band-private information is sent. Note that the XML export will only work if you have your public calendar enabled. See this for information on enabling your public calendar. To export your information as JSON just replace "export_xml" with "export_json" above. To the point: You can have your gig schedule show up automatically in your browser, with links to the gig details. RSS stands for Real Simple Syndication (*), and you can do lots of really cool things with it. It's often used by news sites and bloggers to distribute links to new content. "So why should I care?" Answer: Most reasonable browsers are "RSS Aware", meaning that you can register an RSS feed and the current gig schedule will automatically show up in your browser. The following is an example of setting up a WheresTheGig RSS feed with Firefox (free) version 1.5. The details may differ for your browser. Click on the link at the top of the page. After you fill out the "Create RSS Feed" form and click the button, an RSS icon will appear in the browser's address bar (what the hand is pointing at): If you don't see the RSS icon, click the link that says "click this link to show the RSS page" to display the RSS page. Some browsers will then provide a bookmark menu for assigning the RSS feed. (*) There is some controversy about what RSS stands for. Google if you want more info about this. Users must be associated with band personnel, just like the Personnel Black Outs. See that FAQ entry for instructions on how to make the user / personnel associations. You must verify that the mileages are correct before using the mileage in any important documents. The mileages are computed based on your home and venue addresses using Google's Map API, and errors are not unheard of. If any errors occur during the mileage computation then the gig mileage will be set to "0". You can either correct the problem, if possible, or just enter the mileage value manually and click the [Recompute] button at the page bottom to recompute your mileage totals. Non-US users: This feature probably won't work for you. If you'd like it to let me know and I'll put in the effort to try to get it working for non-US addresses. then retry by clicking the [Get Gig Mileage] button again. If the problem persists, let me know. The multi-account features are controlled using the " Multi Accounts View" link on the lower navigation bar of the "Display Gigs" tab. Add account associations using the "Add account" panel. To show all gigs from associated accounts, click the [Enable Multi Account Gig Display] button. To disable the multi account gig display, click the [Disable Multi Account Gig Display] button. To switch accounts, select the account from the associated accounts list and click the [Set Current Active Account] button. This is much more convenient than logging off of one account and logging back in. You can only take actions (e.g. edit, delete, details, etc) on Active Account gigs. Gigs from associated accounts will have their summary displayed in the gig list. In the calendar view, associated account gigs will show up as the account name in parenthesis. Clicking on the calendar entry will show the gig summary to the right of the calendar. No actions can be taken on associated account gigs. If you want to take an action on a gig from a different account, use the "Multi Accounts View" page to switch to the appropriate active account.